New-account-opening data should identify customers who qualify for special privileges or for restricted second chance accounts. Boston, August 2, 2016 – Many U.S. consumers’ financial reputations were devastated due to the recent recession and wound up in industry databases of known checking account abusers. But regulators are strongly encouraging large banks to decrease or eliminate their reliance on these databases to decline new accounts. How can financial institutions effectively balance the risk of their demand-deposit-account portfolios while meeting regulators’ expectations? This research explores the risks FIs must balance when opening new accounts and regulators’ concerns regarding industry databases that exclude consumers from financial access. 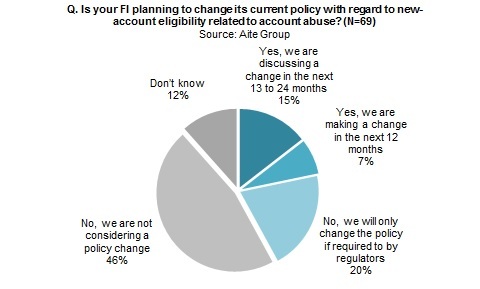 Based on an Aite Group online survey of 69 FI executives, it reveals FIs’ plans to evolve their new-account-opening and product-placement strategies. This 29-page Impact Note contains 25 figures. Clients of Aite Group’s Retail Banking & Payments service can download this report. This report mentions Capital One, the Consumer Financial Protection Bureau, and JP Morgan Chase.